It snowed here in Maine on Thursday, snowed steadily all day long and into the night. In western Maine, it exceeded fourteen inches, while here on the coast, we topped out at about eight. It was, as we say in Maine, a beaut! And a perfect opportunity to spend a day at home. I spent part of my time going through yet another box of family ephemera, and found this masterpiece tucked inside one of my old report cards. 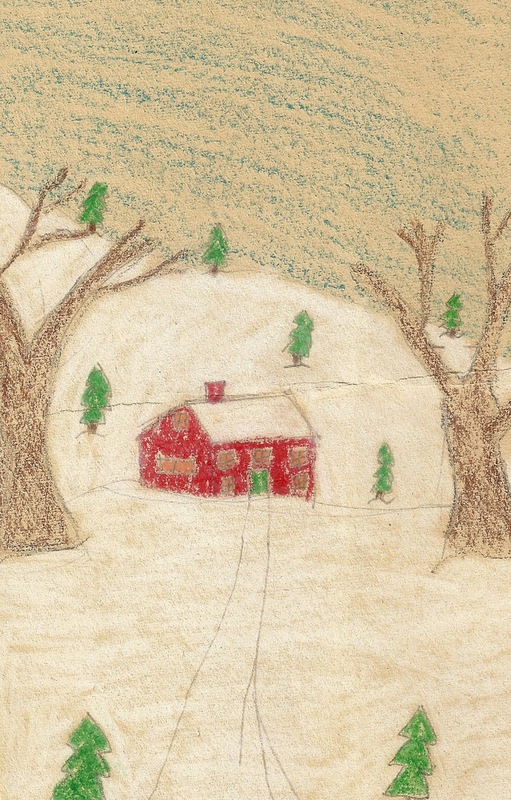 I drew it for my parents (or so it says on the backside) in 1956, when I was in the fourth grade; it was originally folded just above the roofline to make a stand-up Christmas card. I was a careful planner in those days – you’ll notice that everything’s plotted and outlined in pencil, then colored with, in all probability, Crayolas. There’s something about the trees that makes me smile – those small, triangular fir trees plopped willy-nilly over the hillside; the thick-trunked deciduous trees (elms?) 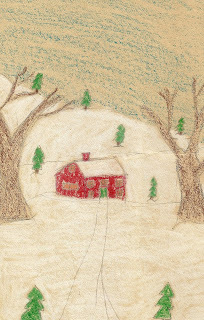 on either side of the path that leads up to the house – the red clapboard house with a green door (those are Christmas colors, for certain) and a warm yellow glow in all the windows. When I found this drawing, I began to think about other places I have lived; began to think of my history in terms of houses. My parents had a late 19th-century, dark gray house that overlooked Portland harbor in the 1950s (my mother insisted it was the color of a wet elephant, although I have no idea how she knew what a wet elephant really looked like). After that, they bought a series of old white ramshackle farmhouses in the Midcoast area, some with wonderful connecting architecture involving outkitchens, sheds and barns. The first house I ever owned was an 1820 cape near the Kennebec River in the town of Richmond – I couldn’t see the river, but I could smell the water from my front porch. From there I moved to a small Greek Revival townhouse (white with black shutters) with a curved staircase, then another sweet farmhouse up in the Eastern River valley section of Kennebec County. Now I’m here, in this house, back in the Midcoast area. First and last: Happy New Year to you all! I’ve got this old cardboard box in one of the cupboards under my living room bookcases; it’s a shipping box from The American Stationery Co., Peru, Indiana. It’s postmarked 1923 (I think – it’s hard to read), and it’s addressed to Frances T. Gould, 1206 Boylston St., Newton Upper Falls, Massachusetts. I’m sure that it originally contained my great-grandmother’s notepaper, but now it’s full of old holiday greeting cards that she saved from the late 1800s and early 1900s. This yellow-fringed card was sent by Cora Day in 1882. Fringed cards were the rage! All the larger card manufacturers produced fringed cards in the 1880s, including Louis Prang in Boston and Raphael Tuck in London. The more clever ones had a Christmas greeting on one side and a New Year’s wish on the other; some opened like small books (although when the fringes meshed, separating the pages could get pretty tricky); others had an additional string for hanging – either on a tree or as an ornament (my great-grandmother used to tie them to the window-shade pulls in the living room!). A Miss Dresher sent along this die-cut, bell-shaped card. When you open the card, a pop-up scene of a crowd outside a church appears. It’s clearly British: the stonework, the arch, the coach driver’s livery – the whole thing smacks of English gentry. The detail is amazing – there are children in bonnets and pinafores, gentlemen in topcoats and hats, a deacon with book, ladies in ribboned finery! It's true that old Christmas cards weren't necessarily illustrations of what we now consider Christmas themes: Santas, sleighs, decorated trees, snowy landscapes, perfect children hanging perfect stockings. Years ago, flowers, birds, tropical isles and other non-Christmas images were common; things that make us scratch our heads in wonder -- like this last card. It reminds me of Edward Gorey – slightly funereal and not at all Christmassy. It’s a bright pink card (also die-cut) with a gold border and string for hanging – but it’s the artwork that is so incredible – red, yellow and blue flowers, ferns, stalks of unidentifiable weeds and twigs. And a nasty, yellow-ish spider, lurking in a handsome web! My best wishes to all of you for peace, simplicity, honesty and integrity this holiday season and throughout the new year. In the 1830s, Sir Henry Cole, who was the director of the Victoria and Albert Museum in London, used to buy pretty papers on which to write his annual Christmas greetings to friends and political allies. It was long, laborious process – cutting the papers to size, handwriting each and every “Merry Christmas,” signing his name. How much easier his annual work would be if he could send the same message to all! So in 1840, he hired a friend of his – John Calcott Horsley – to make a single, well-designed card (more durable than paper) that could be reproduced in unlimited numbers – the first mass-produced Christmas card! The first run was 1,000, a second run brought the total to 2,050 (what an unusual press run – what’s with that last fifty? ), and sold for a shilling apiece. Horsley probably made some Christmas cash, and Sir Henry must have had a much easier holiday! But that was Britain; what about here in the USA? Louis Prang brought the Christmas card to the United States in 1875 (see LOUIS PRANG’S INTERLOPER post of 9/15). At that time, Christmas cards were not necessarily scenes of winter wonderlands, decorated trees and Santas; oftentimes they were flowers, pretty woodland drawings, colorful birds, etc. By 1881, Prang was printing 5 million a year (five million!) and here are two of them, pulled from a collection of family cards. The card at the top of this post is a Louis Prang card of 1879. It’s very small – 4” x 2-1/2” – a little bigger than a business card – and was either hand-delivered or sent in a separate envelope. The sender (Frances Sabin) gave it to her sister (Ethel Sabin); it’s a sure bet she didn’t mail it! Anyway, strawberries, daisies, lovebirds? Not your standard Yuletide symbols. That same year, Frances and Ethel’s mother (Roxanna Adams Sabin) received another Louis Prang from an Aunt Harriet. I have absolutely no idea who Aunt Harriet is, but it doesn’t look particularly Christmassy either. This last one is not a Prang, but at least it’s beginning to look a little bit like Christmas! It was sent to Roxanna in 1883 by her brother Samuel G. Adams (the Boston Police Superintendent I wrote about on October 20). It’s quite big – 7” x 5” – and it actually has glitter! Every place on the card that has snow also has a light layer of glitter (you can see it in the tree on the right; it appears as yellow/orange dots and smears). For some reason, I thought glitter was a modern day elaboration, but this proves me wrong! It’s a stunner, isn’t it? I’ve got more in this collection; will post some next week as we move into the Official Christmas Season! Frances Taylor Sabin and Ethel Wheeler Sabin – Frances married John Allen Gould; they were my great-grandparents. Roxanna Wilder Adams Sabin – Frances and Ethel’s mother; my gg-grandmother. Dietrich Nikolaus Winkel (1777-1826) was born in Lippstadt and settled in Amsterdam. In 1814, while fooling around with pendulums, he discovered that a pendulum that was weighted on both sides of the pivot would keep a steady time: the first metronome! Unfortunately, he never patented his idea, and in 1816, Johann N. Malzel “borrowed” Winkel’s concept, added a sliding scale to it (which made it possible to change the tempo), and patented it as the Malzel Metronome, which is still in use today. This old metronome belonged to my grandfather (the same pediatrician grandfather who carved the Bactrian camel), who was a violinist. My mother (violin) and my aunt (piano) both used it during their practice sessions in the 1920s and 1930s; my aunt went on to teach piano, first at the Department of Music at Colby Junior College (New London, NH), and then privately. I started piano lessons when I was about ten years old, and this same metronome marked time for me, too. I did my practicing on an old upright piano that tucked in underneath the stairway to the second floor in our house in Maine. It had a great bench with a lid, and inside I stored my old John Thompson lesson books (remember those? ); they had red covers and blocky white reverse type. I remember an early piece called “Swans on the Lake,” which my father painstakingly learned finger-by-finger to encourage me to practice (he had no musical ability, so it was quite a challenge for him). My grandfather purchased this John Church Company metronome. John Church Co. was a 19th century publishing company that specialized in sheet music, then branched into other musical supplies – stands, batons, metronomes, etc. There were offices in Cincinnati, New York and Chicago, and I suspect there was a Boston supplier as well, but I cannot be certain. More than you ever wanted to know, right? I’ve seen the metronomes they manufacture today. I prowled around in one of our local music stores and tried a few: they’re pretty disappointing, really. Most of them are battery-operated, plastic gizmos. Some are wireless, pulsating metronomes while others are digital, quartz, with brand names like QuikTime, Dr. Beat, Body Tone...and they all have a mechanical, harsh sound – an unfriendly tone. If I have to mark time, I’ll do it with my John Church; a rich, warm measure. It soothes me – like the ticking of a clock – and in that sound, I hear my mother, my aunt and my grandfather before me. They are still here with me, and we are all still marking time.